So you can give yourself a makeover in your secret ice castle. It's been over a year since Frozen first appeared in theaters, and the madness shows absolutely no signs of stopping. And now there's a Frozen-inspired makeup line. I know, I know. I am so sorry this is happening to you. Anyway, the new line is part of the Beautifully Disney collection, which also features Tangled nail polishes and Evil Queen lipgloss, if your fairy tale loyalties lie elsewhere. 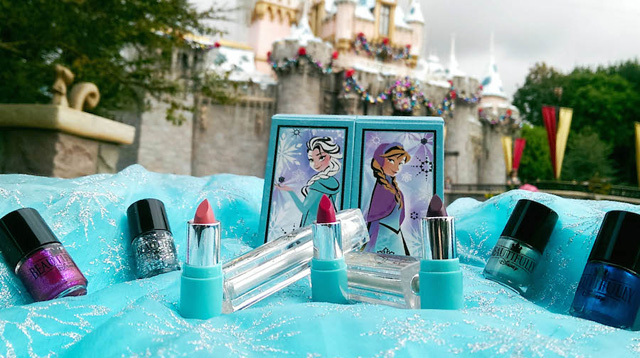 In the Frozen line, there are mini lipsticks, eye shadows, and, of course, nail polishes, all of which look like they're ideal for giving yourself a glamorous makeover while you stew inside an ice castle you made one time when your anger got the best of you. Unfortunately, you can only buy the Frozen makeup things at Disney parks. Total bummer! But hey, Hong Kong Disneyland is just a two-hour flight away?